Here you will find everything NALS has to offer to paralegals, legal secretaries, legal assistants, and all members of the legal support industry. 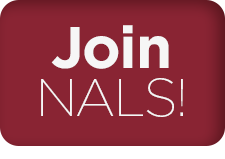 Receive real-time answers to your questions through our membership forums, network with peers through social media and in-person events, participate in surveys, advance your career with a NALS certification, read specialty-specific articles over litigation/civil law, corporate law, estate planning/family law, ethics, etc., or enjoy one of our online education sessions from the comfort of your own home. The NALS website is meant to be a resource; providing the content you need from your choice in a professional association... right at your fingertips.